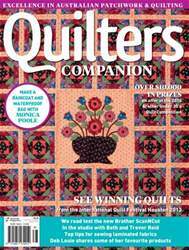 We are continuing with more great projects this issue including a stunning scrappy quilt from Anne Sommerlad, a beautiful pineapple block quilt from Sharon Keightley and a fun and funky pieced quilt from Jess Frost. Margaret McDonald joins us to explain the ins and outs of curved piecing and we have an adorable raincoat and matching bag by Monica Poole. We are in the studio with Beth and Trevor Reid and we explore the making of Margo Hardie’s stunning Baltimore appliqué quilt. We also have inspiring artisan profiles, cool tools to peruse and handy advice from our resident experts Michelle Marvig and Deborah Louie. Enjoy your sewing and see you for the next issue.